Ever heard of CBD isolates? Well, the chances are that you haven’t if you have little idea about CBD in general. CBD oils and vaporizers will remain popular as they are now; isolates, however, are likely to lag behind unless we talk about them. But as always, I’m here to change that. Hey guys, it’s your friend Aaron here, and today I am going to be educating you about CBD isolates. Before I get into the cream of the crop, let me just say that I had avoided these products for a long time – partly because I was unaware of their CBD isolate benefits. Thankfully, my decision to try out isolates proved more than worthwhile. So without further ado, let’s take a look at what isolates do and why you should try them out. In simple words, we can say that CBD isolate is the essence of cannabidiol, presented to you in its purest version. We’re talking about purity that goes up to 99% – a level that would be hard to attain in any other form. Isolates are often used as a dietary supplement because of their powdery nature, which makes consumption easy as a breeze. The pure crystalline form containing only the essential CBD chemical compounds get easily absorbed in our body, making the effects immediately noticeable. Don’t worry; these aren’t compounds related to the likes of gym supplements. CBD isolate contains the essence of only organically grown hemp without the effects of synthetic elements added later. Even though isolates are somewhat of a new addition to the cannabidiol industry, their usage has shown a significant increase over the years. In fact, more people are now willing to try isolates as their first CBD product, rather than vape oils or sublingual. Even wholesalers and formulators have taken a liking to it due to the increased demand. The other thing that makes CBD isolates worth using is the fact that you are in complete control of cannabidiol intake in every serving. This product is mainly for people who want a quicker way to ingest CBD and get on with their day. There’s absolutely nothing wrong with that if you ask me. Without going into too much detail, let me just say that CBD isolates are created by processing hemp oil in a way that leaves behind no traces of chlorophyll, plant oils, waxes, and other material. You get only the purest quality cannabidiol that comes with a multitude of health benefits. Of course, the super-critical CO2 extraction process is maintained here as well. CO2 extraction is the industry standard because it is considered safe and has been approved by the FDA. Also, this method is known to produce purest concentrates that would otherwise be unobtainable. As a result, the process leads to the creation of a botanical concentrate that is rich with cannabinoid properties that are found in hemp plants. The final product happens to be in the form of crystals without detectable levels of THC or other unimportant plant material. The cannabidiol isolate powder does not have any taste or smell, making it perfect to be infused into different kinds of products. Since the substance doesn’t even have THC, it is considered safe to be used by people of all ages. Don’t like taking isolates raw and up for a little fun? Here are some of my favorite ways to consume CBD isolates. Warning: You may never take CBD the same way again! You can easily turn your favorite brand of CBD isolate into an inhalable form because the vaporization point lies at around 180 to 200°C. All you have to do is mix 200 MG of CBD crystals with 10 MG of vape e-liquid at a temperature of 60°C. The final product will be ready for vaping momentarily. This is my personal favorite because I love to vape. Because isolates come in a powdery form and are mostly tasteless, you can consume it by combining with your favorite dish. Be it on top of a plate of spaghetti or baked into pumpkin pie, the choices are endless. Isolates especially dissolve better in food like coconut milk, butter, and cooking oils. So go ahead and get creative! Did you know you can dab isolates by either using a wax vaporizer or an oil rig? Just like other cannabis concentrates, CBD isolates are perfectly “dabbable,” with the added benefit of not causing any high. However, I would recommend you to dab in a safe location, and preferably away from prying eyes. I don’t recommend dabbing just to anyone because there are specific risks involved in this form of smoking. But if you are familiar with the ways, go ahead and dab CBD to your heart’s content. Turning CBD isolate into oil is the easiest thing ever! All you need is either olive oil or any other MCT oil and dissolve the isolate into it to make oil tinctures. You can then store the mixture in a clear glass dropper bottle. Be sure to put it away in a cool, dark place, and away from the reach of children. You already know about the different kinds of CBD ointments and creams available in the market. But did you know that you can make your very own skin care product if you just have isolates? Yes, CBD isolates melted into carrier oil like cocoa butter, shea butter, coconut olive oil, can make for excellent skincare products. Apply topically and get youthful, radiant skin. I might have never tried out this one if it weren’t for my wife’s insistence. She doesn’t consume CBD, but she certainly doesn’t say no to CBD creams. I’ve had the pleasure of trying out many CBD isolates from various brands in the past one year. And among those, the isolate by CBDistillery has to be my most favorite! If you read about this Colorado-based company, you’ll know that they are more than just about selling CBD products. They are also pioneer researchers, educators, and producers of some of the finest cannabidiol products you’ll find in the market. The isolates happen to be just one among them. Because the isolates come in powdery form, you can either consume indirectly by dabbing it onto your tongue or use it as an ingredient in food. Either way, you can expect the same results. Others might suggest different methods, but I stick to these two. To bring you news and suggestion of quality CBD products is my passion, so naturally I wouldn’t be talking about something that disappointed me. 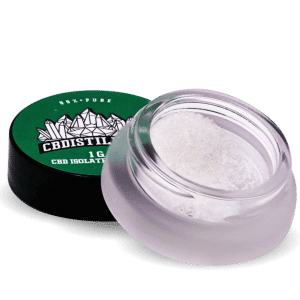 CBDistillery 99% Pure CBD Isolate Powder is a gem of a product that turned me into a believer of isolates. My anxiety was pretty much gone and so was the back pain that kept me up at nights. Because CBD isolates are easy to use, I could carry these with me even to my office and consume as necessary. I did get a few raised eyebrows, but that’s just out of curiosity. This stuff is legal in all 50 states of the US, folks! Don’t let anyone tell you otherwise. On a scale of 1 – 10, how much do you think you know about CBD isolates? Do you know that the most stable isolates are those that are manufactured within a short span of time after harvest? Probably no other company does this, except Medterra. And that is why I’ll rate MED99+ CBD Isolate above all. Hang on! High potency isn’t the only plus point of this product; it has many more benefits just waiting to be discovered. Here are some features to prove my point. People like using isolates for two reasons: 1) for the quick-acting effects 2) for ease of use. You can take these isolates by mixing it with food (easiest) or by merely consuming raw, right out of the jar. I wouldn’t be talking about this product if the results were horrible, would I now? 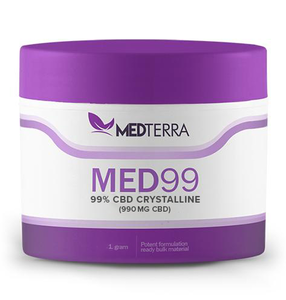 Among all the CBD isolates have used over the years, Medterra MED99+ gave me the least bit of surprise, which is a good thing! I had heard great reviews of the product from many different sources and couldn’t wait to try it out myself. I’ll admit that I was a bit skeptical initially, but just a few uses put my doubts to rest. Having struggled with pain and anxiety throughout the years, I learned how to cherish the moments of brief relief in between. Using this product made me feel like the relief had come to stay for good. Better health, better mood, and better sleep: it’s all in there. After CBDistillery, I did try quite a few products before finally encountering Green Roads World. Why am I not talking about them? Well, that’s because they aren’t worth talking about. Green Roads World is the second brand in the CBD isolate world that managed to rock my socks off – and I am not exaggerating. So what’s unique about this isolate? Well, nothing and everything. Nothing in the sense that this product doesn’t try to reinvent the wheel; everything in the sense that this product is better! According to the official website, you can either use the isolates as a dab wax mix or consume directly as edible. 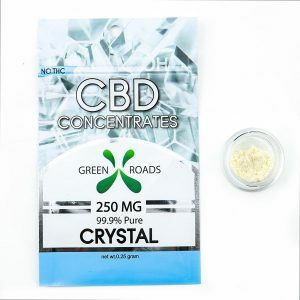 CBD isolate crystal form will ensure that you get good results in the shortest time possible. The effects of this product were phenomenal! After trying out a bunch of crap, it finally felt like I have found something that could help me for the long term. Honestly speaking, I would have just gone back to CBDistellery as my pain and anxiety symptoms were starting to take a toll. Thankfully, this product arrived, and I found something new to talk about with you guys. Go ahead and try this; I’m sure you won’t be disappointed. Word of caution: don’t treat my words as a sort of guarantee because the effect of CBD tends to vary significantly from person to person. Approach with an open mind and expect to be moderately surprised. Now, this is one product I must admit that caught me completely off guard. I wasn’t really expecting anything when I bought it; did it for the sake of trying out something new. But when the effects started kicking in after the first few dosages, the isolate had me convinced that this is going to be a star of the future. This CBD isolate is 99% pure and is intended to be used for those suffering from pain, stress, and other variety related issues. Its main features are as given below. The company recommends that you melt the isolate in oil and ingested either as an edible, vape it, or use a dropper to take orally. As I said, this product caught me by surprise – not only by effect but by also the recommended means of consumption. I wasted no time mixing the isolate with my favorite edible oil to use it as vape oil. I can’t even begin to tell you how relieved I was, getting to vape after so long. It felt like my body had finally found something it has been looking for a very long time. As far as the results are concerned, I’d say they were very good. It successfully repressed my anxiety and pain symptoms as much as I would have liked. Better sleep came as a bonus. You can go for any of the three products mentioned here and expect good results. CBD isolates are readily available online, and you can purchase them directly from the manufacturer’s website.I would recommend you to get CBDistillery’s CBD’s Isolate. In fact, I’ve made things even simpler for you by including purchase links to my Four favorite products. Just click on the links to be redirected the product page; from there you can buy CBD isolate. Will I recommend CBD isolates to everyone? Yes and no. Yes, because this substance is safe to be consumed by people of all ages. No, because the effects of CBD isolate vary from person to person and it’s entirely possible that no two people will get exact results. So I recommend that you proceed with the right set of expectations.